In sunshine or rain, any day is a good day to take kids on a walk down Earth Day Lane. 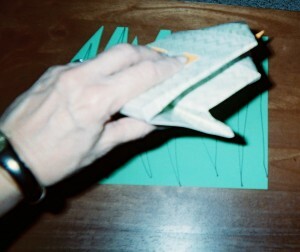 A folded re-used tissue box can become a snake puppet. Easy as 1-2-3 – Save empty tissue boxes and turn them into slithering, striking snakes, like the one in my blog pic here. Simply fold the box, like you see I’ve done, to make what looks like the head of a snake. Cut out and glue on eyes and a long tongue. Suggest to the class that they save tissue boxes at home, as well as in school, so that every student can make a snake puppet like you’ve done. 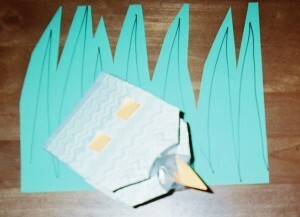 Help children learn about habitats by making simple paper stages for paper puppets. 1. Cut a construction paper grass stage for your tissue box snake and set the puppet behind it or on it, like you see in my blog pic below, to begin a lesson about habitats. 2. Lead this lesson after students have made their own tissue box snake puppets and go outdoors to a grassy area where kids can place their puppets and observe how the grass looks and feels. 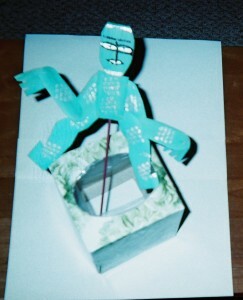 Re-used Tissue Box Puppet lives in a paper carpet of green grass. 3. Back in class, note students’ observations on the board, along with other scientific facts, such as grass is food for some animals as well as habitat for some. 4. Connect the science lesson to reading and writing by instructing students to write a short story or poem about their tissue box snake puppet. 5. Plan time for volunteer students to present their stories or poems as mini-puppet shows. 6. Show your Ah-Choo Snake Puppet to your school’s art teacher and ask for suggestions about other animals and habitats – frogs and ponds, for example – that could be made from folded re-used tissue boxes. Not a shadow of a doubt…Pop-up Puppets delight children! Who knew that something as common as an empty tissue box could be re-used and turned into such fun and effective teaching tools! 1. Cut out most of the bottom of a tissue box, leaving a rim so that the box doesn’t slip down your arm. 2. Draw, color and cut out a flat paper puppet figure. 3. Tape the puppet to a straw or stick. 4. Hold the stick inside the tissue box and make the puppet move up and down. 1. Find a grassy area of your school yard, preferably one that’s visible from your classroom window. 2. Cover a patch of the grass with a piece of cardboard. Hold the cardboard in place with a large rock. 3. Wait two weeks, advising the class that your sun power science experiment is underway. 4. Lift up the cardboard to show students that when grass is kept in the dark it turns pale green or yellow, and dies. 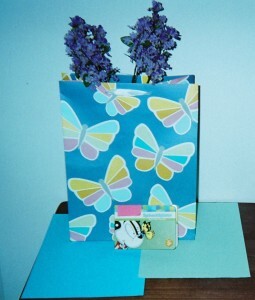 Silk hyacinth stems stand tall inside a butterfly bag with a butterfly book in front. Help students develop their scientific skills with an activity that focuses on observing flowers of all colors, shapes, sizes, smells and locations. Schedule a Flower Parade outdoors or in your classroom or school hallway. 1. Send notes home asking for students to bring at least one live or silk flower to class on parade day. 2. Place the live flowers in a vase of water and the silk flowers in a bag, like you see in my blog pic here, until parade time. 3. Distribute flowers for students to carry in the parade. Optional: Play music for the parade. 4. Ask for observations about the flowers after the parade and note the observations on the board for follow up activities. Teachers can employ imagination to add impact to science lessons. How? Use eye-catching resources that connect with reading and creative writing. The gift bag with a butterfly design shown in the blog pic above connects with the butterfly on the cover of the small book (this one for very young children) in front of the bag. 1. Invite your class to “take imaginary flight on the wings of words” by writing a short story or poem about creatures that fly. 1. setting a pin wheel outside your classroom window for students to observe on windy days. 2. inviting kids to take turns blowing on a pin wheel to make it spin as you begin a science unit that includes wind studies. 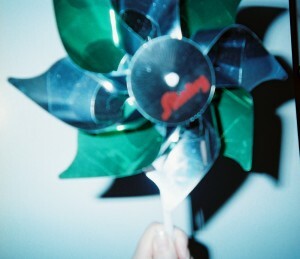 A colorful pin wheel spins in the wind. We’ve all heard the expression, “Earth Day is every day!” It’s true. Teachers can spend an entire school year walking with their classes down Earth Day Lane, introducing multiple science units with simple and fun tools and tricks that catch and keep kids’ attention. Fill your imaginary basket with visuals for environmental education on Pinterest and more ideas in other attentionology.com posts centered on science, including Attention with a Natural Touch, Wow Students with Simulated Sounds of Nature, and Scavenger Hunt to Spark Kids’ Love of Nature. Look for a new Mid-Week Focus on Wednesday, and please send comments about Earth Day Lane in your corner of the world. 5 Pings/Trackbacks for "Ah-choo Puppets Walk Kids Down Earth Day Lane"